The United States government is again using “Prestone” anti-freeze to provide one-shot protection for Army and Navy equipment. Your planes, your ships, your tanks, squad cars, trucks and torpedo patrol boats will he protected by the antifreeze that does not boil away. They will he protected by the guaranteed anti-freeze that outlaws freeze-up, rust and corrosion… the one-shot antifreeze that protects all winter long. In addition to Government demands made on the finished product, “Prestone” anti-freeze, thousands of tons of raw materials necessary for its manufacture are now being used in making vital defense equipment of many different kinds. Some of the important uses to which these raw materials are being put were born in the laboratory but a short time ago. 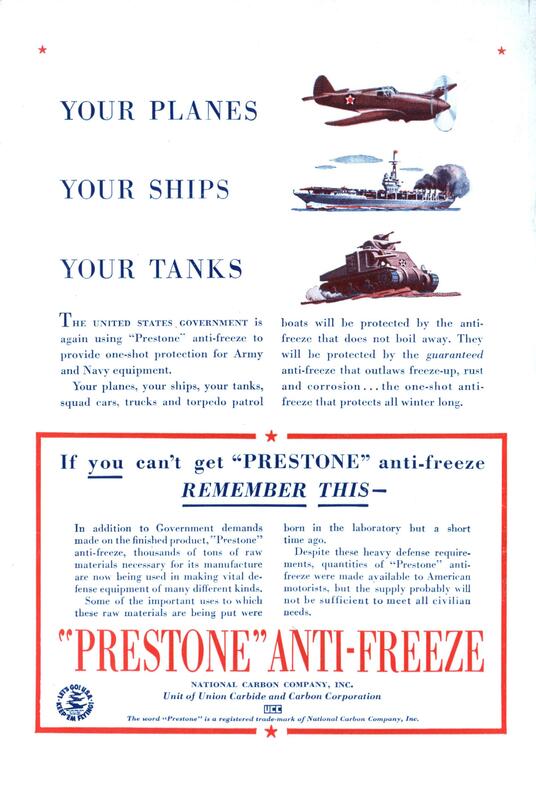 Despite these heavy defense requirements, quantities of “Prestone” antifreeze were made available to American motorists, but the supply probably will not be sufficient to meet all civilian needs. The word “Prestone” is a registered trade-mark of National Carbon Company, Inc. I think the plane is a P-40 and the tank an M-3, who ever thought that side gun on the tank was a good idea? @ Toronto – Maybe it lost its dentures? This is kind of funny. The tank is an M3 “Lee” Medium Tank and they had AIR COOLED Engines! If I remember correctly, the Lee and Grant series of tanks were built because they were having problems making the turrets. The turret ring has to be precisely manufactured so this was a stop gap design. I think the Sherman tank that came after uses the same body. @Tumbleweed1954 According to the wiki they made varients with some having Detrotoit 4-71 diesel engines and some had the amazing Crysler mutilbank engines and those must have been liquid cooled so that must be what they are talking about? @Tumbleweed1954 I was doing more research and I found another motor that the M3 used that was liquid cooled but the story behind it is very fascinating. 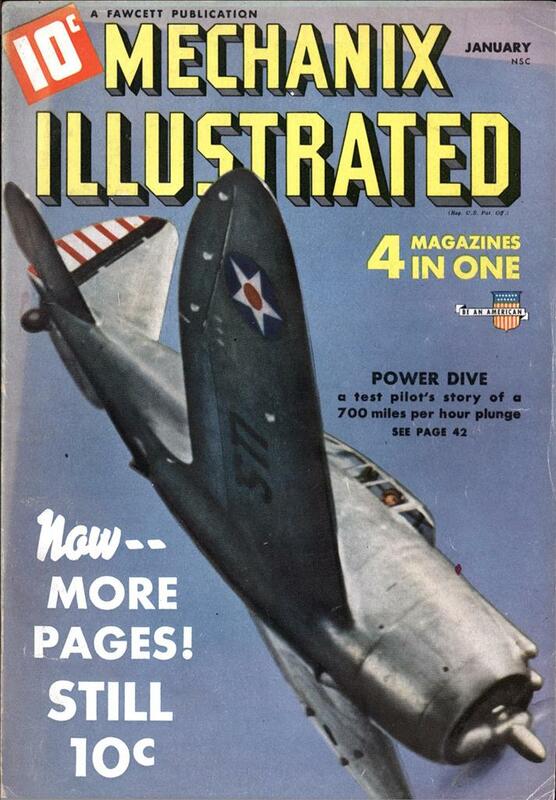 The Chrysler A-57 Multibank engine was a stop-gap measure. It’s amazing what engineers can do with off the shelf parts.